Felicity fans and probably Olicity fans won't want to miss next week's episode of Arrow. Given that we've had to wait weeks for a new episode, I don't think any of us will want to miss it, but from what's revealed in the exciting producer's preview, it looks like this is going to be a very "fun, Felicity-centric episode." Yes! Because who doesn't love Felicity? Admittedly, I can't stop talking about Arrow lately, but it's a surefire symptom of withdrawal, as the show's been off the air for a couple of weeks and we were left hanging on a romantic cliffhanger. Looking at the new producer's preview, a lot of my thoughts on what's coming up tie into the dramatic side of this story as it relates to the relationship between Oliver and the ladies. I said this previously, but I think it's kind of good that some romantic sparks flew for Oliver and Sara, seeing that their "relationship" was an arc left unresolved -- as far as we know -- since they sailed off into the sunset together years ago, and he thought she died. My optimistic outlook on that relationship is that it'll have a chance to run its course one way or the other. And then there's Felicity. We know she has some feelings for Oliver. Whether it's just a crush or something more seems unclear, but there's affection there, at the very least, and there always seems to be some extra tension between those two whenever one of them gets involved with someone else. So it's no surprise that "Time of Death" will bring Felicity to the forefront, in this case, tying into her feeling the need to prove herself and questioning her place among the group now that Sara appears to be sticking around. 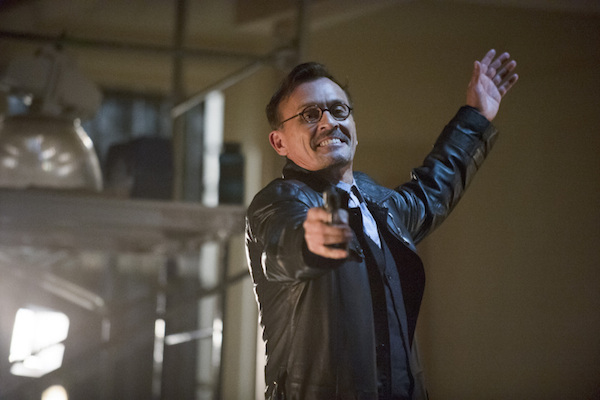 And this new preview indicates that The Clock King is as much of, if not more Felicity's nemesis than he is Oliver's. So she may very well have a chance to prove herself against this guy and hopefully come out of it with some sense of her place within Oliver's team. It's time that happened. Clock joke! But seriously, I like that right after executive producer Marc Guggenheim brings up the question of "Does Felicity have a role to play in Oliver's life or the Arrow's mission," Clock King says "Remember what I told you, timing is everything." Truer words couldn't be said about the nature of a potential romance between two beloved TV characters. If there's meant to be something more between Felicity and Oliver, timing will be everything. If it happens too soon, expect it to fall apart eventually. If it doesn't happen soon enough, maybe that great tension between them will fizzle. So be patient, Olicity fans. Maybe it'll happen. Meanwhile, Oliver being with Sara might affect Felicity, but it's even more likely to affect Laurel, assuming she finds out. She's already having personal problems, and knowing her sister is alive is likely bringing more anger to the surface. We recently saw the flashback that revealed Laurel's reaction to learning that not only was her sister lost at sea with Oliver, but also presumably having some kind of affair with him. How do you get angry at your sister and grieve her death at the same time? I'm going to assume she chose grief and shelved the anger, but knowing Sara is alive now, Laurel may be ready to let the pent up anger out, and that could be even more explosive if she discovers Oliver and Sara are together. Assuming they're together. It's hard to measure the full scope of this situation based on one passionate kiss. Either way, I can't wait to see this "welcome home party." Ok enough of the drama talk. Who's ready for the Clock King? 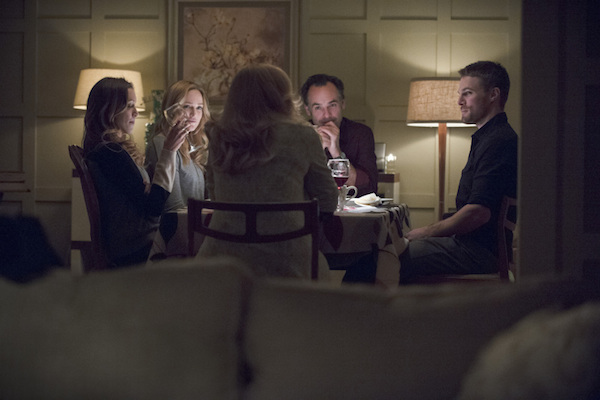 Arrow returns Wednesday, February 26 at 8:00 p.m. for "Time of Death". That's episode 14 of Season 2. But if you're eager to look much further ahead, Stephen Amell recently shared a video that focuses on a day in the life of shooting the series, and there's some very vague talk (and a script cover!) about Episode 18, which you can check out here! Meanwhile, Amell shared on his Facebook page that they just did the table read for Episode 19 and it's "getting tense."